Cozy Comfort Food. Three words to describe the dish of the day - Dal. When you want to feel that cozy under a blanket feeling not outside but inside you, I say make dal. It is warm, hearty and healthy. No guilt trips to the gym either. Dal is such an essential part of Indian cooking. From north to south, east to west, every region has their version of dal. I have so many dal recipes with me that I rotate frequently, some have made it to the blog and some may never make it here. Try out this Spinach Dal or this Restaurant Style Dal Fry sometime. For those who have never attempted to make dal, I encourage you to do so. It is such a forgiving dish. You can add anything or absolutely nothing to dal, and it will still taste good. 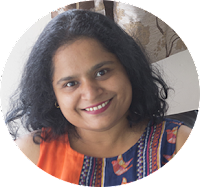 The simplest dal we make is something called "Tove" where all you add is a simple tempering of mustard seeds, curry leaves and green chilli to already cooked pigeon pea lentils or toor dal. Salt is added after it is served. Dal can be that basic. Or it can be cooked with ginger-garlic, tomatoes and spices. Or with vegetables like this Heerekai Tove / Ridgegourd Dal. 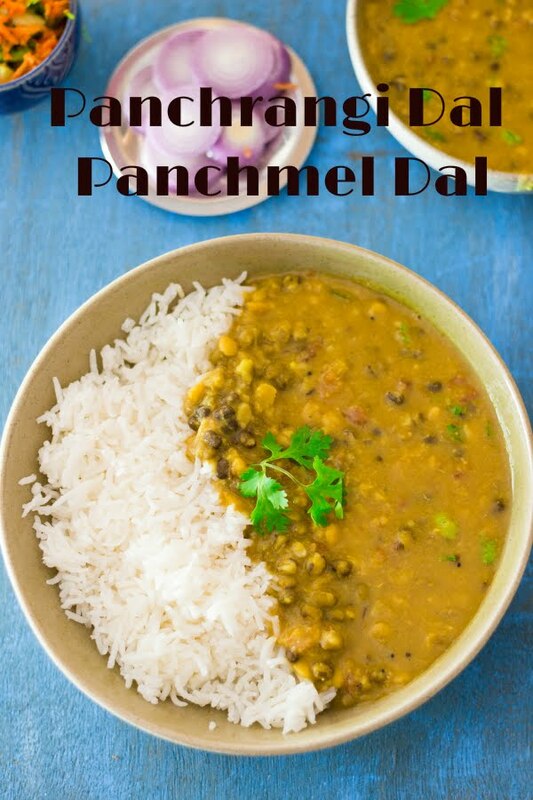 Panchrangi Dal or Panchmel Dal is a mixed lentil dal that uses 5 different types of lentils - Toor Dal or Split Pigeon Peas, Chana Dal or Split Bengal Gram, Sabut Urad Dal or Black lentils, Moong Dal or split Mung Beans and the last is not really a dal - Moong or Mung beans. I learnt this recipe from my Aunt who lives in Gujarat. Pancharangi Dal or Panchmel Dal is a famous recipe across Gujarat and Rajasthan in Western India. These places are arid and hence, home to a lot of delicious spicy lentil recipes. The dals are soaked for 30 minutes to 1 hour and then cooked until done. Dal is meant to be mushy in general. So cook until all the dals are well cooked. Then mush them up with a spoon. Fry finely chopped onions until translucent, then add the ginger-garlic paste and fry till fragrant. Toss in the chopped tomatoes and spices and cook well. Add the lentils and little water along with salt and simmer until you have the consistency you desire. Pancharangi Dal | Panchmel Dal is a Gujarati Dal made from 5 different types of dals and beans. It is a spicy mixed lentil soup. Soak all the dals in water for at least 30 mins. Cook in a pressure cooked until cooked. Once the mustard seeds splutter, add the cumin seeds and allow them to brown slightly. Add the chopped onions and fry until translucent. Add the ginger-garlic paste and stir fry until for 2-3 minutes until fragrant. Add the chopped tomato and cook for 1-2 minutes. Add the cooked dal, salt and water. Simmer for 5-6 minutes or until you get the consistency you desire.